The fragrance of early spring, bright nights and the awakening nature are characteristics of this tour, which consists of several rides and sightseeing by bus. You will experience the days around the midnight sun visiting the famous turfhouses of Laufás, the whales in fjord Eyjafjörður and the amazing area around the breathtaking lake Mývatn. A midnight ride is a highlight of the week at this special time of the year when the sun hardly sets! 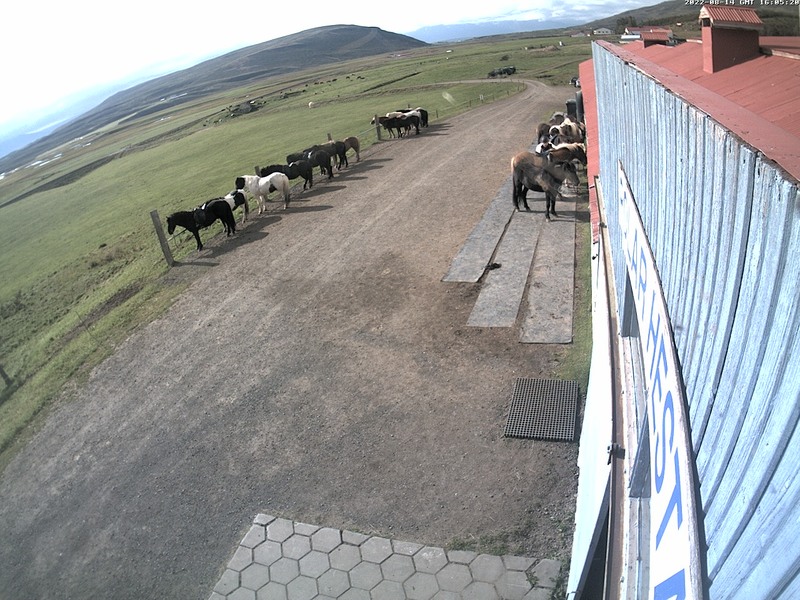 Our guests are picked up at Akureyri airport or the bus station in the late afternoon. A 30 minutes drive will bring us to the farmhouse Grýtubakki. After dinner we will provide details about the next days. After breakfast we saddle our horses for the first riding excursion. We ride through the marshy country of Nes and then after about an hour we reach the valley of river Fnjóská. We cross the river on an old bridge and continue into the valley. River Fnjóská is the longest freshwater river of Iceland. The valley is rather narrow but with a big variety of different landscape. On the way we are enjoying the rushing water and the numberless birds, which are very busy with taking care of the young ones! We will find a nice place for our lunch break and then we turn back to Grýtubakki where we will have coffee and cakes. We ride approx. 4 hours. After coffee we drive to the well-known turfhouses of Laufás. It is a journey into the past! Laufás farmhouse is a pure example of the gabled Icelandic farms of those times. It has been a vicarage from the earliest Christian times. Dinner and overnight at Grýtubakki. After breakfast we ride towards the longest fjord of Iceland: Eyjafjörður. First we ride along river Gljúfurá and then start the surrounding of hill Höfði, which is a remnant of the ice age. We are enjoying amazing views from different perspectives. Fjord Eyjafjörður is one of the best places to spot whales in Iceland mostly the huge Humpback Whales, harbour porpoises, Minke whales and the Northern bottlenose whale. We will stop several times to look out for them! On our way we also see the island of Hrísey. It is the second biggest island of Iceland and gave the fjord its name: Fjord of the island. Coffee and cakes at Grýtubakki. After coffee we saddle once again the horses and enjoy a short ride in the vicinity of the farm. We will be 1 1/2 to 2 hours in saddle. Let's see where the horses will bring us! After dinner we drive to the fishing village of Grenivík, sit down at the beach, listen to old stories and enjoy the midnight sun! Today we will have a day ride to the coast Látrastönd – above steep cliffs, through clear brooks and wonderful green valleys. We will have our lunch break close to the ruins of the old farmhouse Svínarnes. Inhabited until the middle of the last century they are witnesses of formal life. We enjoy the amazing view to the island of Hrísey, fjord Eyjafjörður and the open sea. Maybe we will see again some whales or even the shy seals! Coffee and cake at Grýtubakki. After coffee we drive to the swimming pool of Grenivík. From there we have a surpisingly good view to the fjord and the surrounding mountains! The famous area of Mývatn is our destination today. We have a look at the pseudo crater of Skútustaðir, the bizarre formations made of lava in Dimmuborgir and the bubbling mud pools of Námaskarð. On the way back home we will have a look at the historical waterfall Goðafoss which played an important role during Christianization of Iceland around the year 1000. After dinner we go for a ride in the surroundings of our farm. We will find some nice places to enjoy the midnight sun! The ride will last 2 to 2 1/2 hours. Today we will ride up to the mountains into the wild valley Fjörður. Fjörður is a mysterious and deserted countryside. It has been closed off from the rest of the world for 40 years. Only about 4000 sheep spend the summertime here every year, together with the trolls and elves. Names like Trölladalur, the valley of the trolls and Álfaborgir, the cities of the elves remind us of the existence of these invisible beings. From the rise of Leirdalsheiði we have a wonderful view over to the fjord of Eyjafjörður, the fishing village Grenivík and the surrounding farms. We ride through green valleys, along rushing rivers and over stony paths. Extinct volcanoes, silent glaciers and hidden waterfalls accompany us. In the late afternoon we will be back at Grýtubakki. After coffee it is time to say good-bye to the horses! After breakfast transfer back to Akureyri.